Sure Thing Business Travel is an excellent choice when it comes to hosting your conference. We structure your conference based around your business, conference theme and conference objectives. • Sure Thing Vanuatu is the genuine expert when it comes to travelling to the South Pacific. • Great for fmilies, couples and corporates. • Sure Thing Leisure Travel has a large number of repeat holiday makers who want a business-class service from their travel agency. • We have a first-class world-wide licence which can cover any destination on the planet. • Sure Thing Sports Travel covers all major sports events! • We also organise packages for sporting teams who are travelling together to compete. • Our schoolies department will make sure you get the best package for a well deserved schoolies escape. 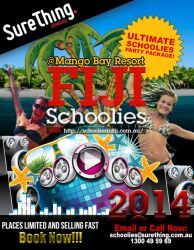 • Sure Thing Schoolies Travel covers the Gold Coast as well as other popular schoolies destinations across Australia. Every Snow Package is available - all at the best prices. Sure Thing Snow Travel covers: Flights, hotels, car hire, transfers, lift passes, gear hire, etc.